If you’re playing at an online casino in a country where payments made via credit card, debit card or bank deposit are blocked due to your online gambling laws, you might want to consider using e-Pro, an online payment service created to get around payment processing blocks. Read on to find out more about how E-Pro payments work and how you can use this payment method to safely deposit real money to play your favourite casino games on the Web. E-Pro is a product offered by a Luxembourg-based financial services firm called EMPcorp, a brand that combines financial expertise with technical knowledge to deliver global payment methods to online service providers. The E-Pro system has been designed to provide online vendors with a way to accept credit and debit card payments without having to do so directly through the credit or debit card service provider. This allows online gambling providers to process credit/debit card payments from players in countries where such payments are blocked due to the online gambling laws of that area, or where banks have independently decided not to process gambling-related financial transactions. 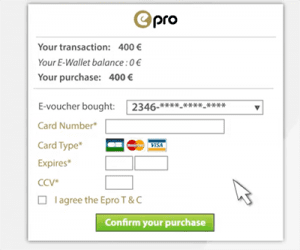 E-Pro exploits a loophole where users technically purchase an e-Voucher from the EMPcorp system using a Visa or MasterCard, with the e-Voucher instantly processed to the casino site where you’re trying to make a deposit, all within a single transaction. It allows you to use your credit card without the payment going through your bank or payment service provider, as the transaction is processed entirely through the E-Pro system instead. You don’t need to sign up for an account to use E-Pro, you simply need to find a reputable online casino that accepts this payment method. Choices are slim at the moment, but it’s likely more online casino vendors will turn to E-Pro to find ways around payment blocks imposed by certain banks in the future. Sign up for an account with the casino and head to the cashier section. Select E-Pro from the list of payment methods. You’ll be redirected to the E-Pro payment platform, which offers a standard credit card payment form, where you need to enter your usual credit card details like card number, expiry date and CCV. Your payment will be processed as a purchase of an e-Voucher, with funds from the voucher instantly transferred to your online casino account so you can start playing real money games right away. It may sound a little sneaky (which it is) but the E-Pro system is entirely legitimate and offers a safe way to transfer funds to an online casino using your credit or debit card where such payments would otherwise be blocked. 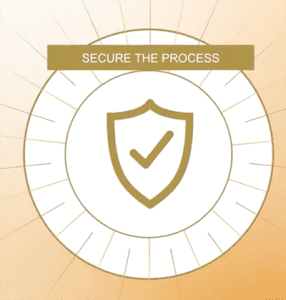 ePro is compliant with the highest financial industry regulations, with EMPcorp following PCI security standards and the operational requirements set by the Payment Card Industry Data Security Standards Council, which exists to protect the data of all card holders. The company uses an advanced fraud detection policy, with a special focus on real time fraud detection and prevention which has been developed by experts in the field. EMPcorp staff members are expertly trained to understand the regulations required by the e-Commerce industry and stay up to date with changing laws, maintaining close relationships with banks and payment service providers. In addition, payments processed with E-Pro at our recommended casinos are all protected by a minimum level of 128-Bit SSL (secure socket layer) digital encryption security, which works by scrambling all information sent over a secured connection so your payment information can’t be intercepted by hackers. ePro also has the added benefit of not having to share your financial information with the online casino itself, which may provide further peace of mind to the most security-conscious players. 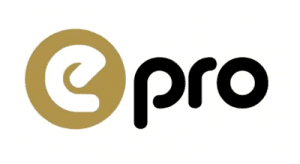 E-Pro is a payment service we are only just starting to see at online casinos, so it may take a while before this deposit method becomes widely available. One of our favourite online casino sites accepting e-Pro payments is Slots Million, a vibrant instant-play casino offering over 1,600 real money slot games along with a large selection of table games, card games, number games and the world’s first ever virtual reality casino. Payments using e-Pro are only available to players from certain countries, but there are plenty of other safe deposit options available. E-Pro deposit alternatives include credit cards, debit cards, web wallets and pre-paid cards, with different methods available depending on which country you’re playing from. To understand more about the online gambling laws which apply to you, check out our guide to international online gambling laws. For a full list of the top-rated online casinos accepting players from your country, check out our casino tables which have been customised to only recommend the best casino sites catering to your region.